I spent one week as au pair to look after my 28-month-old granddaughter in South Hadley, Massachusetts, while my daughter attended an international science meeting there. Exploration of the Internet before setting out did not point me in the direction of any playgrounds in the area, but I did find three wonderful sites to visit with her. 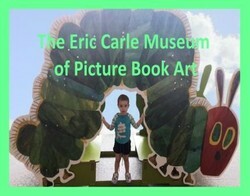 The Eric Carle Museum of Picture Book Art was the first one we visited. Come see the Gallery with me and maybe you will want to go there with a child and maybe you will enjoy it as much as I did. I don't know how much my granddaughter remembers of our visit, but every time I think back to it, it makes me smile. Part of what was so special about the visit was the warmth, helpfulness and friendliness of all the staff I came in contact with, from the young women working at the reception desk to the library staff to the marketing manager who spoke with me about this article at the end of my visit. The huge white gallery lies in the green pastures at the entrance to wooded Hampshire College. You either get off the bus or park your car and enter a world geared toward the curiousity of children. I wanted my granddaughter to be familiar with the drawings in at least one of Eric Carle's books before we arrived at the gallery. In anticipation, therefore, I bought her the classic, The Very Hungry Caterpillar, and read it to her a few times the day before. The first hall we visited, called the West Hall, had a display of drawings from several children's picture books. She ran immediately to the caterpillar. Seeing a collection of books in boxes on the benches in the middle of the hall, I decided that the most fun activity for her there would be to find the pictures on the wall to match those that we could see in the books. It didn't take her long to understand the game, and she ran happily around the room, screeching with delight when she found each new drawing I showed her in whatever book I was holding at the moment. Her new favourite book was now: The Very Busy Spider. As described above, our visit to the West Gallery was a fun and educational experience for my granddaughter. The exhibits currently at the Central and East Galleries were of less interest to her and she was not impressed with the very impressive huge art installations in the main hallway, but this was not a problem. There was still plenty more for her to enjoy. We both loved the library. Not only were there hundreds, maybe thousands, of books for children of all ages, there were also toys to explore on the floor: two wooden dolls' houses, cardboard blocks to build a tower with, and much more. At one point, she took some books off the shelves on her own, and sat herself comfortably in one of the easy chairs and read aloud to herself. While my granddaughter was busy exploring the treasures in the library, I chatted with the librarians and learned about the qualities of a good children's book. That helped me later select a few new books from the bookstore before leaving the gallery a few hours later. There is a well-equipped large art studio with huge windows on one side instead of a wall. The professional staff can help your child (and you, if you want) to engage in some hands-on arts activities. My granddaughter enjoyed playing with the puzzles and she even made a valiant effort to use the stamps and ink to place some images on paper. That was a bit beyond her, but she tried several times before moving on to try something else. As we were leaving the room, a group of adults came in - I assumed that they were teachers on a study day. Both in a film we saw in the gallery theater and briefly at a display at the entrance to the art studio (shown to the right here), Carle explains his art techniques: His illustrations are collages made from coloured tissue paper. Children get to try their hand at making similar collages both using the templates seen in the photo here and by working with tissue paper at the art tables. That task was a bit took advanced for my granddaughter. She did, however, enjoy watching the film with me and we each got something very different from it. Snacks? Well, Not Really . . . There is a snack bar that supposedly has freshly prepared healthy organic snacks for visitors, but the day I was there there was nothing available other than some "healthy" junk-food in a vending machine. It was a good thing I had brought a picnic lunch with us as we would have had to leave early were we not able to have something to eat. The gallery is essentially in the middle of nowhere, so be sure to bring whatever sustenance you will need for your visit. I was pleased that there was free coffee. That was a very welcome bonus. If the weather is good, neither too hot nor too cold, you can sit outside on their patio. My granddaughter was so excited when we went to relieve ourselves - she took one look at the child-sized toilets and shouted out in glee - "Mine!" There were also cute tiles on the walls with illustrations from Carle's books. Of course, I picked out a few books to take home. While my lesson in early childhood education was still fresh in my mind, I wanted to put this new knowledge to use. I think I did pick out a book or two that I might have overlooked before the librarians so generously explained to me how children understand books. Of course, it was also fun to buy my granddaughter an over-priced t-shirt with the very hungry caterpillar on it. We was staying at Mount Holyoke College in South Hadley and the bus to the gallery ran right alongside the campus. The bus, in fact, runs all the way between Amhurst and Holyoke Mall south of the town of Holyoke. Unfortunately, bus service was not very reliable and I ended up taking a taxi back to the college; during the summer, the buses only run hourly and for some reason the one I was waiting for just did not come. That meant an unnecessary and very upsetting expense, but I did not allow that to affect my joy at having spent a wonderful several hours at the gallery. For museum opening hours and admission fees, consult their website. The website will also give you information about times of films, story-reading in the library, special exhibits and more. What an amazing idea! Offering the art in kid-friendly (and kid-proof) way should become a worldwide standard. Thanks for presenting this unique gallery! I enjoyed the armchair visit and Eric Carle's video. It's wonderful that such places exist. What an interesting concept, a ;lace to honor the art many take for granted. I have been to the Eric Carle Museum several time with toddlers. They loved every minute of it. Somehow they knew they were welcome and enjoyed every minute. I also loved learning more about Eric Carle.